"What is it about the world that you know is true that everyone else doesn't understand?" As everyone is probably aware by now I approach everything in a decidedly esoteric philosophical fashion, which is amusing at first by quickly becomes old when the posts are long and dry. Anyway, if we for a moment stood back and asked what this question meant from a philosophical viewpoint what would we see that might shed some light on this question? If someone asked me this question they would not want to stick around for the answer because each words is like a land mine to me. And the whole question is problematic from the beginning. But it is a perfect example of what I have been saying which is that not knowing philosophy can be a hindrance now and again. But what you really miss out on is the fact that it makes the world a lot more interesting place than it is normally considered to be. The land mines in this question are “World” “True” and “Understanding”. My own orientation is phenomenological and so I am going to interpret them through Heidegger’s use of these terms. So let me explain that and then we will see if the question means anything from that perspective. Heidegger’s Being and Time is all about what he calls Dasein (being there) of the human being who is being-in-the-world. Now Dasein is the ecstatic source of the projection of the world horizon and being-in-the-world signifies that Dasein is in the world it projects itself. So we start with the paradox that Dasein is within its own projected world from the point of view of Being. Now to quickly paraphrase Heidegger “world” is the ultimate horizon which everything appears upon, and it was actually Husserl which came up with this solution to the problem of Bracketing that produced the insoluble problem of intersubjectivity as seen in the Cartesian Meditations. However, Heidegger uses this strategy in a very thorough going critique which Husserl did not agree with so he produced his book Krisis as a response and defined the Lifeworld. So from a phenomenological standpoint world is one of the most important concepts because it solves the problem of intersubjectivity and gets rid of bracketing. Heidegger goes on to do an existentiell analysis of Dasein, which are like the Categories of Kant but applied to the human being, and discovers three faculties befindlichkeit, rede, and verstehen, which I would like to translate as discoveredness, talk, and understanding. Befindlichkeit is the world as you find it already thrown within it and falling groundlessly towards death. Rede is chatter with others in the Mitsein, the intersubjective counterpart of dasein. Verstehen is understanding that is held in common by those who speak the same language. So you can see that Understanding is prominent here but talk and befindlichkeit is missing from a Heideggarian point of view. and of course both dasein and mitsein are here because there is reference to everyone and you. The whole idea that dasein can understand something that mitsein doesn’t reminds us of authenticity. So we got up to the point of accounting for everything but Truth. Now for Heidegger there are two kinds of truth. The truth of logic which is verification, and the truth he finds in Aristotle that goes beyond that which is a kind of Alethia or uncovering. So in Heidegger at the level of Process Being where the ready-to-hand modality appears truth itself is dynamic, a process of uncovering as we see in the Oedipus myth. Now that puts an interesting spin on the sentence above because we could interpret Truth in either way. In a sense this is a very Heideggerian question because it mentions some of his key concepts together. But I want to shift attention outside the question to the context. We are told that Thiel asks this question of people before he works with them. In other words it is suggested that it is a gate, and that if you don’t have an interesting answer to this question the consequence is that he probably is not going to work with you. Now personally I see that as bad faith. Bad faith is a term from Sartre, who develops a framework similar to Heidegger but in French and based on Hegel. Ultimately it was decided that Sartre did not understand Heidegger, but everyone agrees that Bad Faith was one of his best ideas. It is the freedom we exercise when we fool ourselves into thinking our situation is reified and not free, when it is utterly free and we are able to choose differently at any moment. The whole way that this question is presented is a rejection of the freedom of Thiel to ask the question of someone, and the freedom of someone not to respond to a question asked over and over to everyone who wants to work with him, and that we know to expect. Now it is probably just a journalistic gimmick and Theil does not ask this question of everyone, and some people probably don’t answer it, and he probably is not the automaton that the article makes him out to be. But this brings up the question as to why we are so interested in the question if it so blatantly is based on bad faith. And I think that is because we read into the question Thiel’s success and the fact that he has asked that question of someone sometime means we feel that it is also asked of us, and somehow if we answer it intriguingly we might gain the keys to the kingdom ourselves. Because this statement is presented like the words of the Delphic oracle used to be presented in ancient Greece, which was with reverence because the gods had spoken. So in fact it is the context of the question that gives it is real import because the context is our own bad faith and the supposed bad faith of Thiel which I am sure the journalist made up for the effect. So now let us consider how the context and the question itself might be related. The question implies that you might know something that everyone else does not understand, or perhaps you should, or if you don’t you are not worthy of working with the rich, risk taking Mr. Thiel. This scenario reminds me of Obama’s humorous comments on Trump that destroyed his candidacy. We seem to be part of an episode of the Apprentice here. Anyway the most telling thing in the article is the fact that he worked with French philosopher René Girard and he knows about Mimesis. Now I have read Girard’s work and I find it very interesting. And it is all about mimesis but it is also about sacrifice and the role that violence plays in society. But Girard’s work is based on Dumezil and that is the basis of my work, and I think ultimately much more interesting. Girard’s theories are all very strange and distorted visions of human beings and their history, and it is clear when you read them they are completely “wrong” and made up for the purposes of making an impact, but that the truth lies elsewhere beyond the spectacle of Girard’s theory. However in their exaggeration those theories point out some very interesting things about our worldview that are worth taking notice of and thinking about. Anyway there is a rich background there to explore. But back to the question itself. If he was a protégé of Girard then he really must know some Continental Philosophy and so I want to assume he knows Heidegger, and if that is really the case then perhaps his question is truly Heideggarian. And if this was true then it would be a much deeper question than we might give it credit for otherwise. In that case then it is pretty straight forward and it is really a question about the relation between dasein and mitsein and the orientation towards process truth, i.e. uncovering of truth, which could be seen as discovery or innovation or creativity in a wider context. The straight forward Heideggarian answer to this question would be to shift from the Pure Presence level to the Process Being level and say that what I know that others do not understand is the dynamic nature of truth that goes beyond verification. In other words from Heidegger’s point of view there is only really dasein as being-in-the-world and when it is immersed in the mitsein (everyone) it is inauthentic, so to be authentic it must recognize its own death as the ultimate horizon with respect to all its actions. And of course to escape bad faith it must not reify itself turning itself into an object, which Sartre adds to the problem of being lost in the They or everybody. Heidegger would read the question as asking what do you know about truth that everyone else does not understand, because there is no actual reference beyond dasein itself, i.e. the world is the ultimate horizon and there is nothing beyond it to point to, and thus because dasein projects the world in an ecstasy there is nothing beyond dasein, even thought there appears to be when dasein is inauthentically immersed in the other. If Thiel was asking this Heideggarian question then it would actually be the question “do you know who you are?”, implying as background that who you are is dasein as being-in-the-world who knows that truth is the uncovering of not just things in the world but the world itself and thus Being. Apollo said know thyself, and from a Heideggerian perspective the question would be Do you know yourself, or are you lost in authenticity in the mitsein. From Heideggers question it would not be about whether you know a fact that no one else knows about the world which would be an ontic answer. 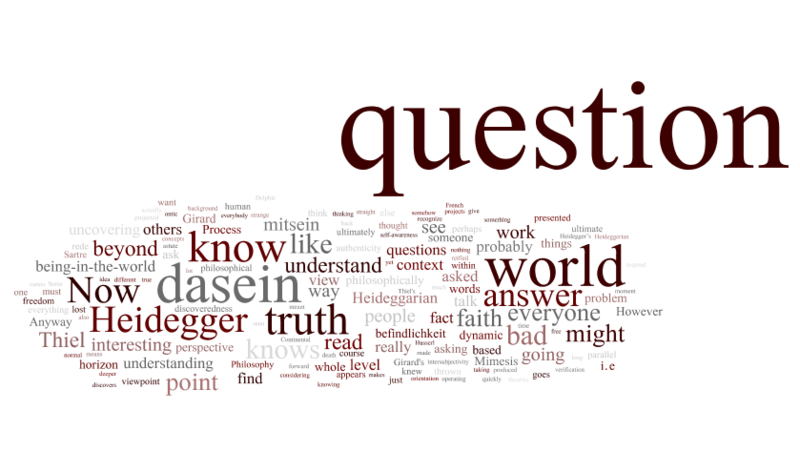 But instead we would read the question as embodying the structure of Dasein itself, and that is why it is strange that it does not mention befindlichkeit and rede, i.e. discoveredness and talk. There are then parallel questions like What is it you know about your-being-in-the-world that you know authentically but those lost in the They (everybody) does not understand, when viewed from the perspective of dynamic truth as uncovering. The parallel questions would be about what you know about talk and your discoveredness, i.e. your groundlessness discovered as already thrown into the world. And the reason we need those parallel questions is that their overlapping or intersection is Care (Sorge) which Heidegger discovers as the ownmost core of Dasein. So the three together would be tantamount to asking what do you care about as dasein emerging from mitsin and knowing about the dynamic nature of truth as being-in-the-world. You are thrown into the world where you find yourself, but that is a world you have projected almost entirely by talk which is based on your implicitly or tacit understanding of the world that comes from living in it with others yet by your self if your realize the potential of your authenticity. Now we have read a lot into Thiel’s question that would be assumed from a Heideggarian point of view. But does he mean that even if he knows Heidegger via Girard somehow. My answer would be no. He does not mean that in any technical sense. But he might have a different perspective on the world from that was generated by studying Continental Philosophy and his question might be just there to find out whether any of the people he is dealign with has a philosophically informed view of things like him and Soros, by the way Soros went to LSE and was influenced by Lakatos like I was. However, ultimately I prefer Feyerabend. My point is that he is unlikely to find many philosophically astute business men in America who might get that a question like this has deeper resonances. And of course starting from Heidegger we can read into it Girard and the whole idea of Mimesis but that would be going overboard. What I would expect is that he would ask a different question each time to see if anyone in the room was more philosophically astute than normal, and that is a way of testing the waters because his philosophically driven viewpoint is going to make him do things in a way that most people are not going to understand because they are not operating at that level of sophistication. Anyway I will leave it there for now. Perhaps later I will give my answer to this question. It is a good question in that it is thought provoking as long as we don’t fall into bad faith or inauthenticity when we are considering it. Any reified question is bad if it is repeated senselessly. For instance I don’t recommend you ask this very question to people your plan to work with in some kind of repetition, or mimesis of this specific question. Rather I suggest you transform your viewpoint by considering philosophical questions seriously, and meant to be about you, and who you are within your world. Then like Thiel you will recognize the others who are operating at the same level fairly easily with some seemingly innocuous remark whose answer will tell you volumes about what the person knows he knows, and does not know he knows. For instance, Socrates went around Athens asking people questions because he knew he was ignorant, yet the Delphic Oracle said he was wise. In the end he figured out that he knew he did not know anything, but that others thought they did although in reality they did not because what they knew could not stand up to the simplest questioning. In a way the question if answered with an ontic answer reveals that you think you are special, and that is a warning to look out for that person. However, if you respond with an ontological answer then Thiel knows you have some self-awareness beyond the normal lack of self-awareness that seems to be rampant here.